Click here for information on the Suzuki Baby/Toddler class. 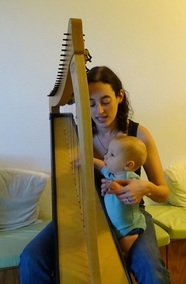 "Lisa Lamb is a fantastic harp teacher! She is so great with my daughter, who is 11 and completely new to music. I'm amazed at all they do in their 30 minute sessions. My daughter was playing a few simple songs after just one lesson and it was so gratifying for her." "We are so fortunate to have such a talented harp and flute teacher in the Cedar Park area. In addition to being a great teacher, she is a fantastic harpist for a wedding or other special event. She played the service music for for our son's wedding as well as accompanying the soloist. Her music made the occasion even more special." Lisa has served as co-director of the Young Texas Harp Ensemble and director of the Austin Flute Choir. She was assistant director of the Penn State Flute Ensemble, and co-founder and co-director of the Lincoln-Sudbury High School Flute Choir. Lisa has instructed private flute and harp students of all ages. In addition, she has taught pennywhistle and beginning piano lessons. During the summers of 2007-2011, Lisa taught courses in theory/composition, flute, and chamber music to students age 8-18 at the Indian Hill Music Center Summer Day Music camp. In the summer of 2008, Lisa was the beginning harp class teacher and orchestra woodwind instructor at the Penn State Summer Music Camp. Lisa completed the Teacher Training courses for Suzuki Harp Books One and Two and Suzuki Early Childhood Education Stage One. This 110 page book includes games and activities for harp teachers to use with their students in private lessons, as take-home assignments, or in group classes. The games reinforce concepts including music theory, note reading, rhythm, dictation, ear training, musical forms, musical terms, music history, and more. They can be used with a wide variety of ages and levels. This 106 page book has many of the games and activities from "Harp Games" adapted for use with all instruments. Both treble and bass clef are included.